BENGHAZI, Libya (AP) — Egypt deepened its involvement in the fight against Islamist militias who have taken over key parts of Libya on Wednesday, with officials saying Egyptian warplanes have bombed their positions in the eastern city of Benghazi. The two officials, who have firsthand knowledge of the operation, said the use of the aircraft was part of an Egyptian-led campaign against the militiamen that will eventually involve Libyan ground troops recently trained by Egyptian forces. The operation, they said, was requested by the internationally recognized Libyan administration based in the eastern city of Tobruk. That elected administration was thrown out of the capital, Tripoli, by rival militias allied with Islamic political factions. The officials, who spoke to The Associated Press on condition of anonymity because they were not authorized to speak to the media, said the operation would last three to six months and involve the use of an Egyptian navy vessel as a command center off the Mediterranean coast near Tobruk. Renegade Libyan general Khalifa Hiftar, who has vowed to wipe out the Islamist militias, is not leading the operation, they added, with Cairo dealing directly with a newly appointed Libyan chief of staff who has visited Egypt several times in recent weeks. In a televised statement on Tuesday, Hifter, who was an army chief under Gadhafi before joining his opponents decades ago, said that he will resign and transfer power to a young army leadership. Tobruk-based Libyan Prime Minister Abdullah al-Thinni told Dubai-based Sky News Arabia that all troops involved in the battles in Benghazi are under the command of the new chief of staff and are instructed to restore state institutions and combat terrorism. “After the appointment of the chief of staff for the Libyan army, all military operations are under the umbrella of the state and its military leadership,” he said. Libyan lawmaker Tareq al-Jorushi confirmed to the AP that Egyptian warplanes were taking part in the ongoing operation in Benghazi, but said that they were being flown by Libyan pilots. He says the planes were “rented” by the Libyan administration from Egypt. Al-Jorushi is awaiting confirmation of his appointment on the Tobruk-based parliament’s national security committee, which is responsible for such issues. He is also the son of the head of Libya’s air force, Gen. Saqr al-Jorushi. He said he learned that the planes are Egyptian from the new chief of staff. In an official statement posted on Egypt’s state-run news agency however, presidential spokesman Alaa Youssef denied that Egyptian planes were striking targets in Libya. Libya has been mired in turmoil since Gadhafi’s ouster in 2011, with militias operating with impunity and the government unable to rein them in. In recent months, Islamist militias swept through Libya’s two main cites of Tripoli and Benghazi, defeating anti-Islamist forces, setting up their own government and reviving an old parliament. Egypt, which has publicly stated its support of the elected administration based in Tobruk, views the presence of hard-line extremists near its western border as a direct national security threat. It had made no secret of its willingness to offer military support to the Tobruk-based government, saying it would train and arm its forces. Egypt’s direct military involvement, however, reinforces the notion that Libya has become a proxy battleground for larger regional struggles, with Turkey and Qatar backing the Islamist militias while Egypt, Saudi Arabia and the United Arab Emirates support their opponents. Earlier on Wednesday, a top Islamic militia commander based in Benghazi said Egypt sent its warplanes to hit his group’s positions. “We have photographs of the Egyptian warplanes and Egyptian naval forces stationed in eastern cities,” he told the AP. He said the planes were taking off from an airport in Libya’s eastern city of Bayda. “The Egyptians are bombing us day and night and only want to seed divisions among us here,” he said, speaking on condition of anonymity for fear of retribution. It is unclear what Egypt’s involvement can accomplish. The Libyan army and police have been in shambles since the collapse of Gadhafi’s regime, and attempts by successive governments to disarm and integrate former rebels into the army have failed. U.S. officials confirmed in the summer that Egypt and the UAE were involved in airstrikes against militia positions in and near Tripoli. Egypt denied involvement, while the UAE said nothing publicly. Speaking to reporters in Washington, State Department spokeswoman Jen Psaki said she was not in a position to confirm the strikes, but that such a move would raise concerns for the United States. “Broadly speaking, we would be concerned about outside interference in Libya, which is consistent with the communiques we’ve signed onto,” she said. Wednesday’s airstrikes preluded what many believe to be a concerted push against the Benghazi militias, and Hifter has described the fighting as a “turning point” in the war against the Islamists. Residents contacted by telephone said they saw warplanes striking camps of several Islamist militias fighting under an umbrella group called the Shura Council of Benghazi Revolutionaries. Armed men have set up checkpoints and cordoned off their neighborhoods to prevent militias from using their districts as staging ground for attacks army forces, they added, speaking on condition of anonymity for fear of reprisals. As night fell, there were conflicting reports over who controlled several military barracks after fighting in Benghazi. An Islamist militia commander said that his group’s forces took over army barracks housing tanks and a second commander said that three people have been killed in the fighting so far, without saying which side had suffered the losses. He says the takeover of the barracks came after an Islamist suicide bomber blew himself up at the camp gates. The commanders also spoke anonymously because they were not authorized to speak to the press. A Benghazi hospital official said that the death toll had reached nine, mostly civilians. A security official allied to Hifter denied the claim, saying that the general’s troops “liberated” one of the barracks controlled by “extremists,” killing a leading member of the Ansar al-Shariah militia. Ansar al-Shariah was implicated in the deadly assault on U.S. Consulate in Benghazi in 2012 which left four Americans dead, including the ambassador. 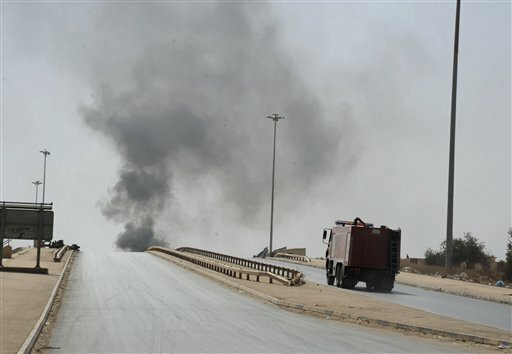 “I am in the street right now, with my colleagues, and Hifter’s forces are deployed to the center and engaged in fierce clashes,” said the official, who is a member of Benghazi’s official security body. He and the hospital official also spoke on condition of anonymity for fear of retribution. Michael reported from Cairo. With reporting from Matthew Lee in Washington.